Having too much credit card debt is stressful and finding a way to ease your debt can be confusing since there are several options available to you. 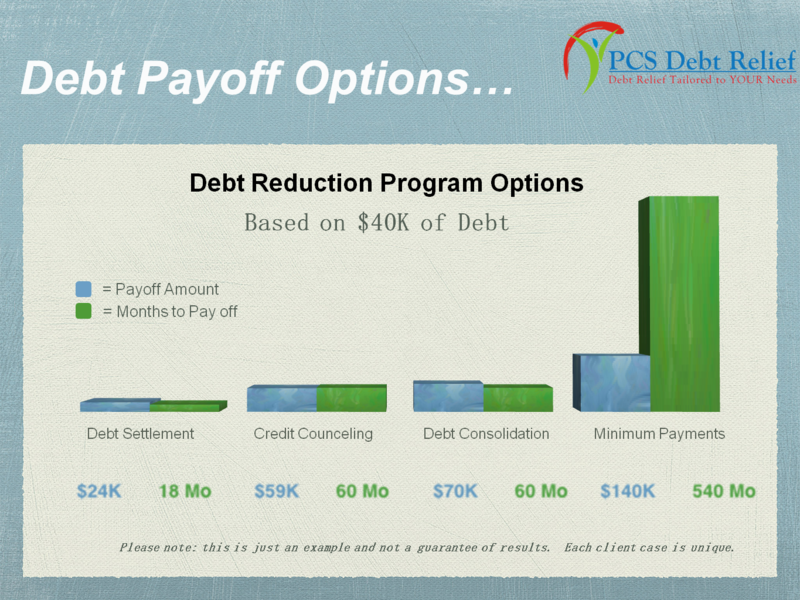 One of these options, credit card debt settlement, has the potential to significantly reduce the amount of your credit card debt you have to pay. It sounds great, but we have found our clients almost always have these 4 concerns when they are trying to decide whether or not to choose debt settlement as the solution to their credit card debt problems. 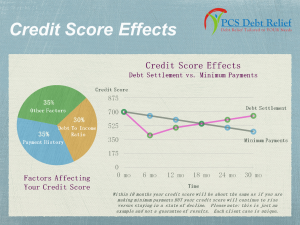 Concern #1: What will happen to my credit score if I choose credit card debt settlement? This is a legitimate concern but what you may not realize is that your credit score is probably already decreasing. Your credit score rating is based on a number of factors but the two most important ones are your debt to income ratio and your payment history. If you look at the chart below you can see that if you are only making minimum payments on your credit cards, your debt to income ratio will put pressure on your credit score, decreasing your score over time. The rate of decrease is dependent on how long you keep your credit card balances. 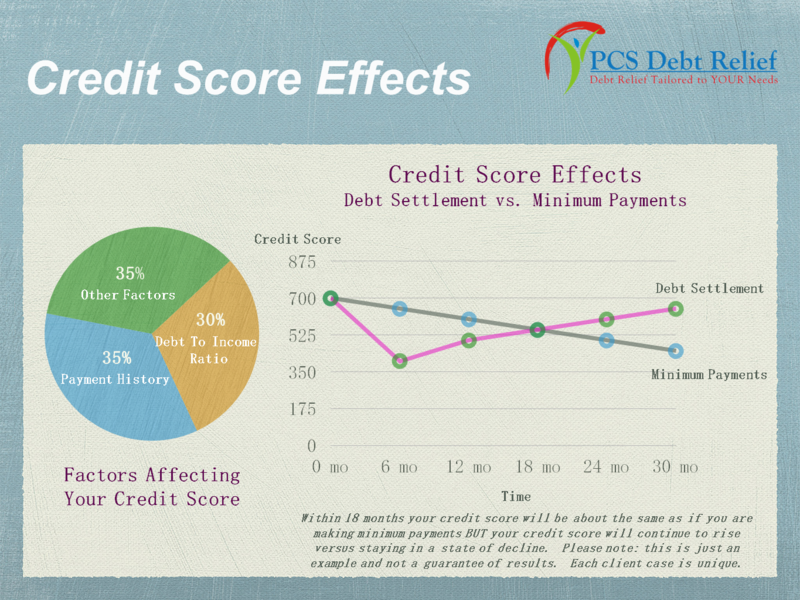 While doing Debt Settlement, your score may decrease initially, but as each account is settled your debt to income ratio, which is 1/3 of your score, will be greatly improved, resulting in your score quickly increasing versus being in a constant state of decline. See what one of our clients has to say on Yelp. As an added benefit, the total amount of debt paid is far less than making minimal payments AND you are out of debt much faster. 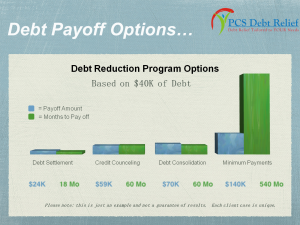 The chart below shows an example of the difference based on $40,000 of credit card debt. Think of the nest egg you could build for yourself if you didn’t have to pay it to your creditors! Concern #2: What about the Tax Consequences of Credit Card Debt Settlement? It’s always best to speak to an accountant regarding any tax questions, but most clients are able to prove insolvency so the forgiven debt is not considered income to them. Here is how the IRS defines insolvent and what can be done. And here is the link to the IRS Form 982 for entering information on Reduction of Tax Attributes Due to Discharge of Indebtedness. It’s understandable to feel bad about not paying your debts and we would never advise on debt settlement if we were in any way hurting the creditor. Your creditor would also not finalize settlements with us if they hadn’t gained a profit from your debt. Let say you have $50,000 in debt and your minimum payment is $1500 a month. Over one year you paid $18,000 and over 5 years, you’ve paid $90,000. But your balance is still $50,000. You can clearly see the creditor has received more than your debt balance, yet you still owe the full balance. Creditors profit when you only make minimum payments. They would love for you to make minimum payments for 30 + years but that doesn’t help your credit score nor does it help your financial situation. So by settling your debt and paying a portion back, not only are you still giving them more profit, but you’re also preventing yourself from filing bankruptcy in which case your creditors wouldn’t get anything. By missing payments, there’s a small chance of getting sued. Only 4% of our clients have ever been sued. This is a very low percentage. The primary reasons their account goes to a law firm, is because they’re in a very long-term repayment program or they were not saving the funds required due to a job loss or other unavoidable situation. If, in the unlikely situation that our client is sued, our negotiators still negotiate any accounts that go to a law firm, relieving the stress for our clients. All of these concerns should be considered when you are making a decision about whether to use credit card settlement services. Also remember to consider the minimal risks associated with credit card settlement against the future financial stability of you and your family. Continuing to make your minimum payments could be a much greater risk as it doesn’t allow for any unexpected situations. If you still have concerns about any of these topics or ones we may not have addressed please reach out to one of our debt advisors. This blog post does not provide legal advice and should not be used as a substitute for obtaining advice from an attorney licensed or authorized to practice in your jurisdication. The comments and opinions expressed on this site are of the individual author and may not reflect the opinions of the firm or any individual attorney.